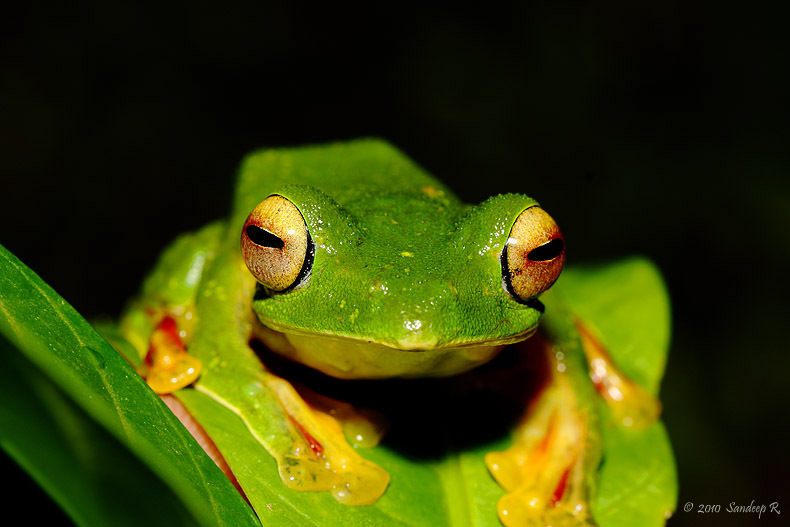 Agumbe, tipped as the cherrapunji of the South, is one of the wettest places in the world. 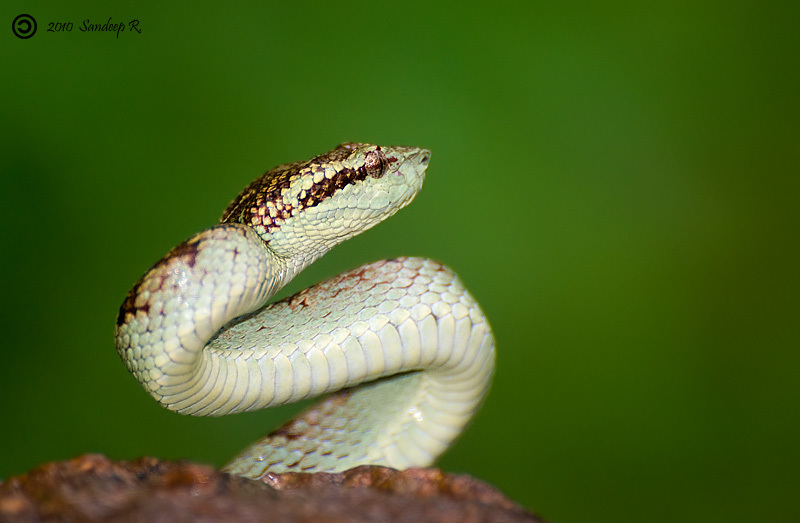 I wanted to visit this place for photographing reptiles and amphibians that emerge out during monsoon. After missing it in last two monsoons, I visited ARRS this year. Quite an experience it was! After a lot of thought, I dropped the temptation to drive and instead booked a bus to Agumbe. Arun dropped out at the last (few) hours of the trip. A few calls later, Hemant agreed to join. He was called in at about 6pm by other Arun. Bus was to leave at 10pm. Quite a lot of time? Not so if you are in Mumbai. 6:10pm – Mumbai Airport. 6:30pm – flight from Mumbai to Bangalore. 8:00pm at BIAL. At 9pm, Hemant is at bus stand. Roughly at about 10:15 the bus took off. Gerry, Josh, Farid and Nathan were in the same bus. A wearing 9 hour journey got us to Agumbe by 7:30am. It was raining. Yeah, this is what you expect here. Josh and others left in a jeep, while Arun, Hemant and I looked for autos. After searching a transport for 10-15min, we decided to walk, in the pouring rain, to ARRS that is about 2-3km from the bus stand. Though excited initially, we realized the walk was not worth in the pouring rain carrying our reasonably heavy baggage. At the camp, met Harish, Chetana and others. I was tired, thanks to my incapability to sleep in bus and thanks to my sleeplessness in the last few days. Took some rest. 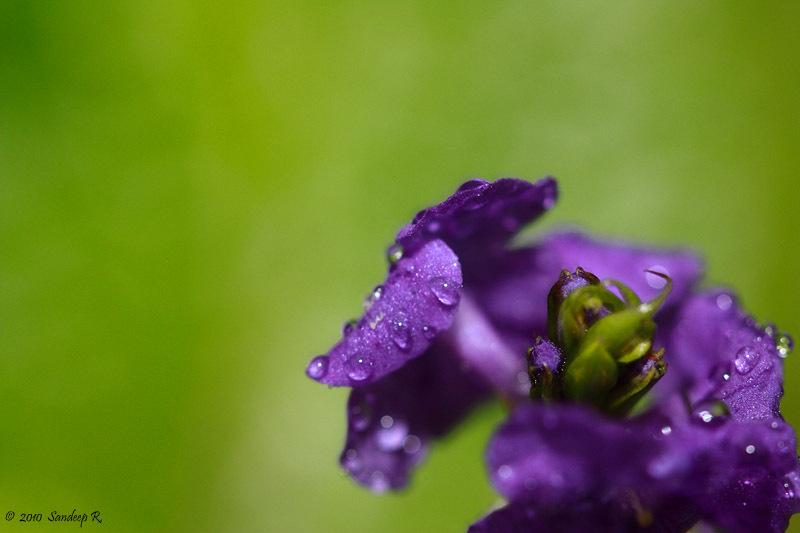 Then, tried out the Canon 100mm macro lens and Canon Speedlite 430EX II. I was getting used to this gear I had borrowed from Selva and Sandeep. During lunch, chatted with Harish, Gerry, Josh, Vinay and others and later ventured out for a ‘walk’ with Gerry. I was expecting to walk around the camp, maybe venture into wood, but not walk in a stream for 2-3kms! It was fun, no doubt. Provided incredible photo opportunities as well. Gorillapod came in very handy to capture some long exposure shots. Chetana in yellow, Gerry in green, Farid in blue boots, Nathan in black and Dhamini crossing the stream. I had to cut short my shoot and continued the walk. It was an incredible test for my new woodland shoes. I thought of the quote ‘While you own something, no matter what it is, use it as hard as you can and enjoy it.‘ and moved ahead. The water level was changing as we walked, and the algae coated stones/rocks were slippery. It was raining perpetually. Good test for EOS 450D and 18-55mm I thought. I had tucked the cam under my rain jacket when not shooting. My confidence with rain-handling-capabilities of my cam grew as we walked more and more. I begun to use it without much care. Stupid mistake! A sudden drop and rise in water level. My foot went a feet lower, and my cam took a dip. That’s the end of it! I had switched off my cam, fortunately, when it took a dip. Got back to the room to dry it. The worst part of the place is that nothing dries, not even your hand kerchief. Not even the fire wood, I realized, as it took considerable effort to lit the fire. 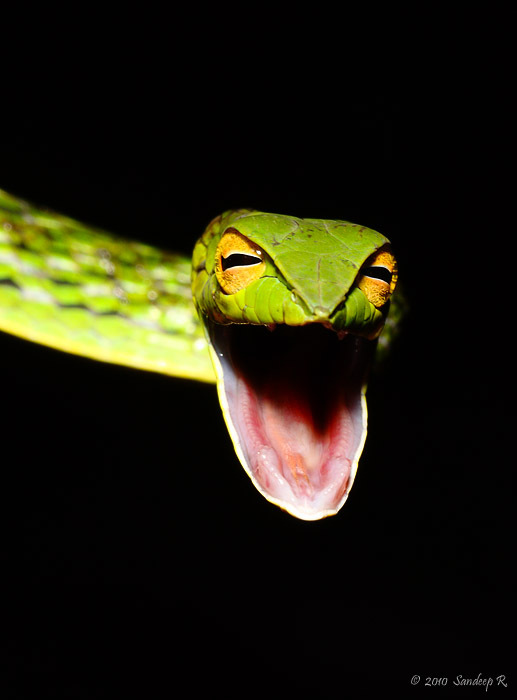 Since my camera was unusable, I had to borrow Nikon D90 when we found a Malabar Pit Viper. On one had, I was disappointed to have my camera dead while on the other I was excited to see this snake. I did not spend much time looking for frogs since I didn’t have much incentive (of photographing), we did find many species of frogs. On Saturday, we went to a small waterfall that was close to the camp. The opportunity to create different images are infinite here, only made difficult by the perpetual rain. 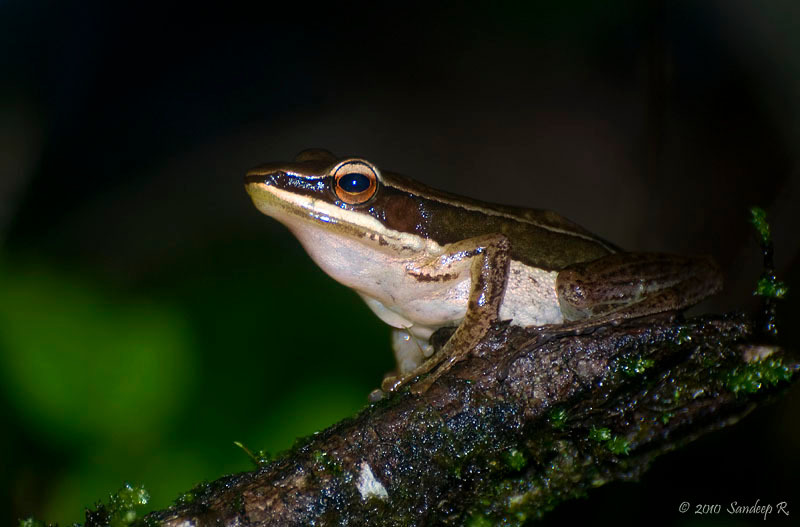 Day and night we were able to find a variety of frog species: Borrowing frog, Bronzed frog, Bi-colored frog, Ramanellas and many others. There were out there, one just needed the eye to see them. 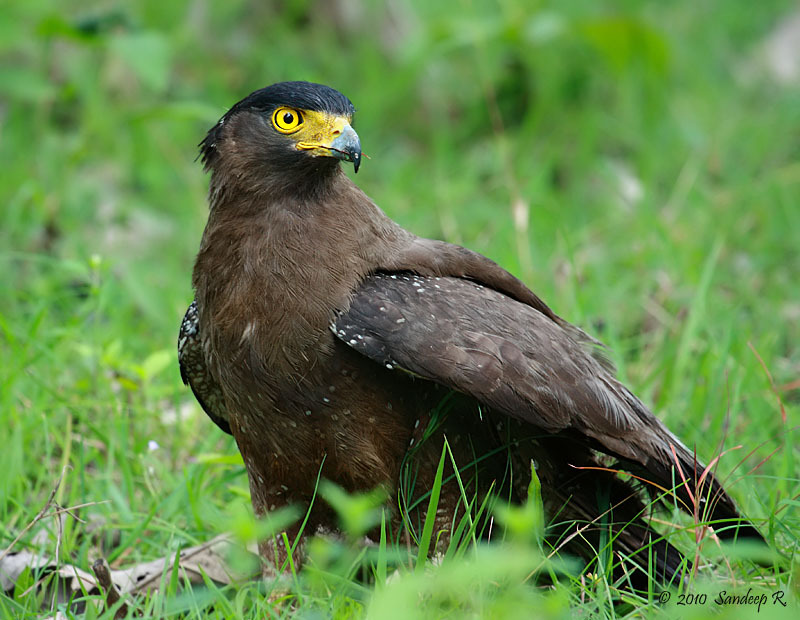 I was keen on photographing Rhaco, that was one of the reasons I was at Agumbe. Friday night we weren’t successful in finding it, but Saturday we got lucky. 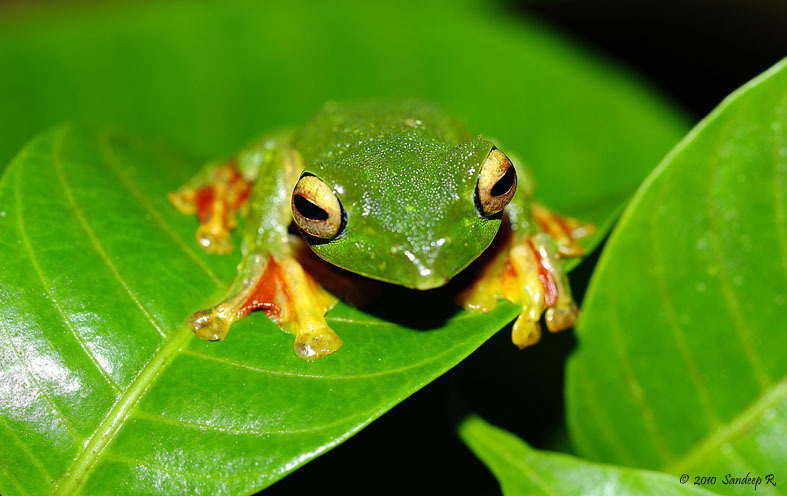 Thanks to Ben for finding the Malabar Flying Frog. 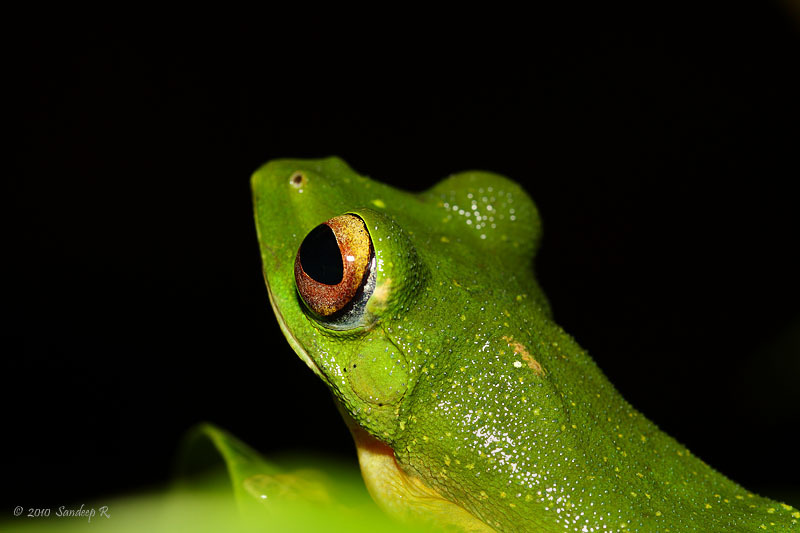 Hemant shared his Canon 1000D, and I could capture a few photographs of Rhacophorus malabaricus. 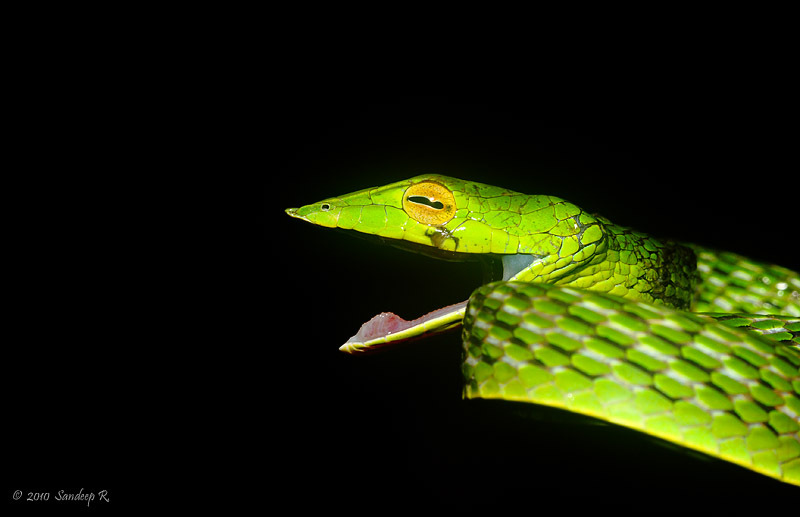 We had found a Vine Snake on Friday night, but couldn’t photograph. On Sunday morning, we found another one that I could photograph. This little one got threatened and wanted to scare us away. Notice the black and white scales on it’s body. 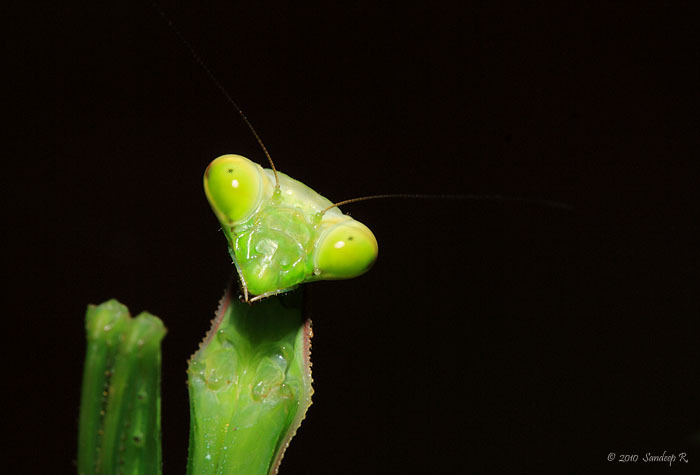 What otherwise is a well camouflaged green body, it changes to scare away its predators – our cameras in this case. There were plenty of other interesting insects, especially the ones Ben was able to find – a foot and half long stick insect (I had never seen a stick insect longer than 4-5 inches), a whip scorpion, Vinegarroon, that emits vinegar when threatened. It was exciting to see Caecilians, limbless amphibians, that stay underground most of the time was also very interesting to see. It was unfortunate that I didn’t have my camera at my disposal for photographing these. I packed up by late afternoon. My camera showed signs of life after a day and half in the dry room. It had not been resurrected fully, but I was sure it would survive. Though at times felt this could be the excuse to buy 7D, I am glad my camera survived when I reached Bangalore and dried it. Though I couldn’t photograph much, I got to understand what to expect on my next visit, probably next monsoon. P.S. : Photographs here are captured on Canon EOS 1000D, Canon EOS 450D, Nikon D90, Canon 18-55mm IS, Canon 100mm f/2.8 USM, Nikkor 70-300mm VR, and Canon Speedlite 430EX II. 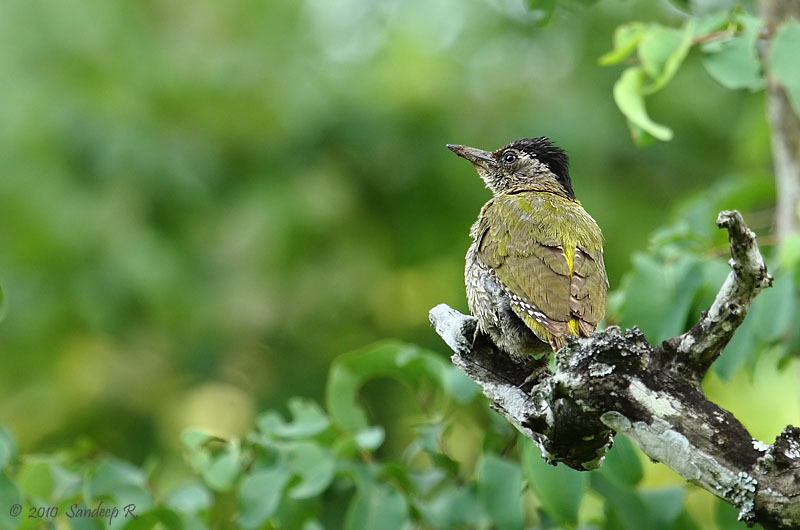 Monsoon is not the best time for sighting wildlife, or so is the belief. Monsoon is also not the ideal time for photography. But wildlife always throws surprises. Butch and I were not keen on any particular sighting, but wished to see a pack wild dogs (at least after learning about a pack of 31). Ramesh was our driver on the first day’s evening safari. Half an hour into the safari we saw 3-4 jeeps coming from the opposite direction. They had seen a tiger cross and said they were expecting it to cross this path (one that leads to Subrayana katte). I asked Ramesh to take jeep in reverse without starting it. I didn’t want other jeeps to go ahead and block our view, and didn’t want the tiger to be disturbed because of our jeep’s noise. Butch and I were sitting at the rear end of the Commander. Just as the jeep moved, a tiger emerged out of the thick lantana bushes right next to our jeep. She was right next to us, not more than 7 to 8 feet. I clicked an image, and realized she was too close. As I zoomed out, couple of other jeeps that were behind ours moved towards her out of the jeep track, overtaking our jeep. She turned back for a moment that i missed to click as i zoomed out to get her in the frame. She strolled away from us, scent marked on a tree and slipped into the bushes. The sighting lasted about 25 seconds, but the closeness was surreal. Rest of the safari was spent in tracking her to a waterhole, where she didn’t appear. 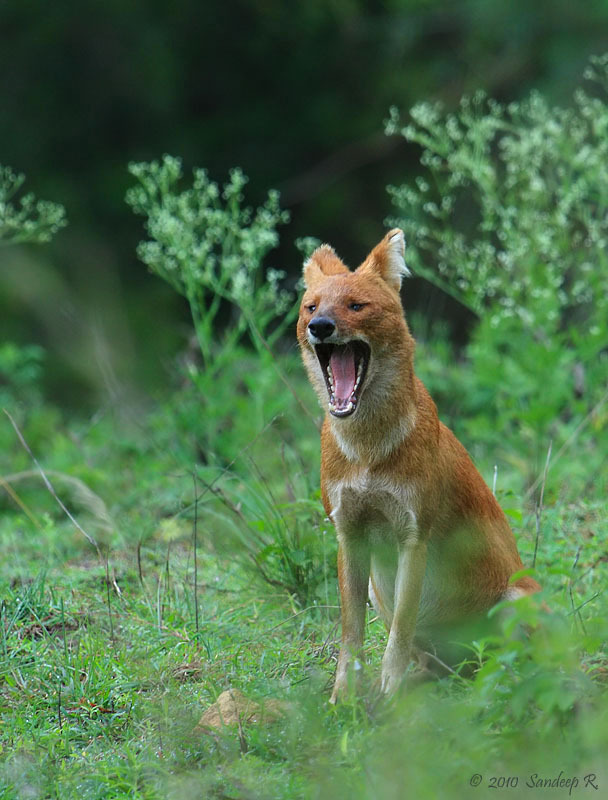 Monday morning safari started with sighting of few wild dogs on the highway. They were moving inside, towards tavare katte. 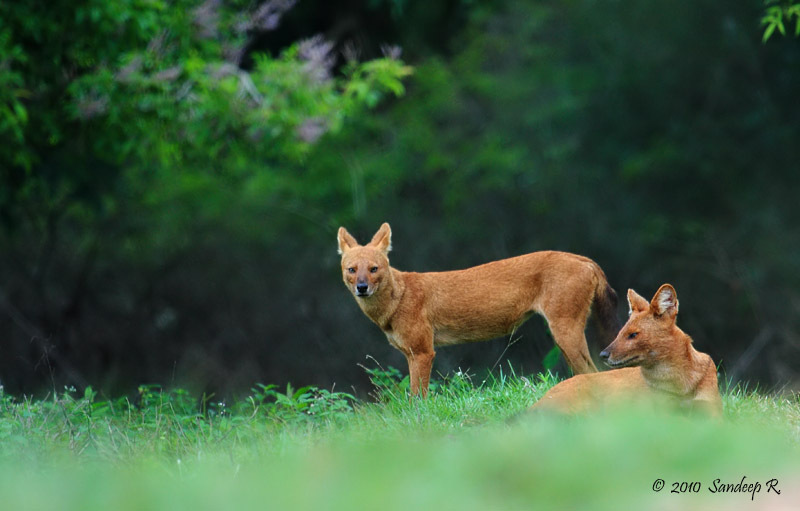 It’s not easy to miss a pack of 31 wild dogs even if you have little idea of their movement. We caught up with them within 15min. The alpha dogs attempted to make a kill of Sambar fawn, which swan to the middle of the lake. Realizing that the effort was not worth, the pack leaders moved on follwed by sub adults and older pups of the pack. We were sure they will make a kill soon. Within minutes we saw a stag emerge out of bushes, chased by alpha female. She stopped momentarily seeing the jeeps. Taking this chance the stag crossed the road and scampered for an exit. Since there were only 3 jeeps, the dogs were comfortable and had enough space for themselves. The pack leader chased down the stag, faster than a sprinter. Stag was trying to gore the dog with his antlers, but the agility of the dog dodge him and made quick bites. 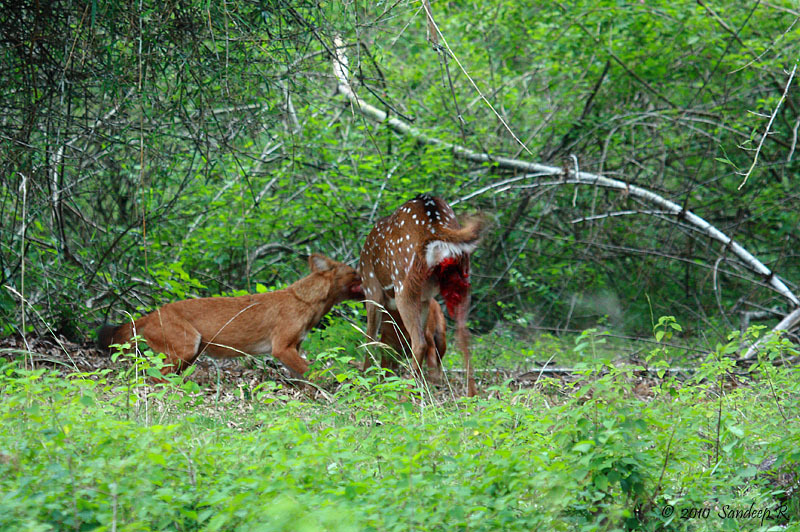 Within seconds we could see the flesh and blood from the rear of the deer. The lead dog was joined by another. One caught the stag by neck and the other started eating from the rear. There is nothing clean or swift about this kill. Each bite will rip piece of flesh from the prey. The action was simply incredible to watch. No photograph makes justice to the scene i witnessed. 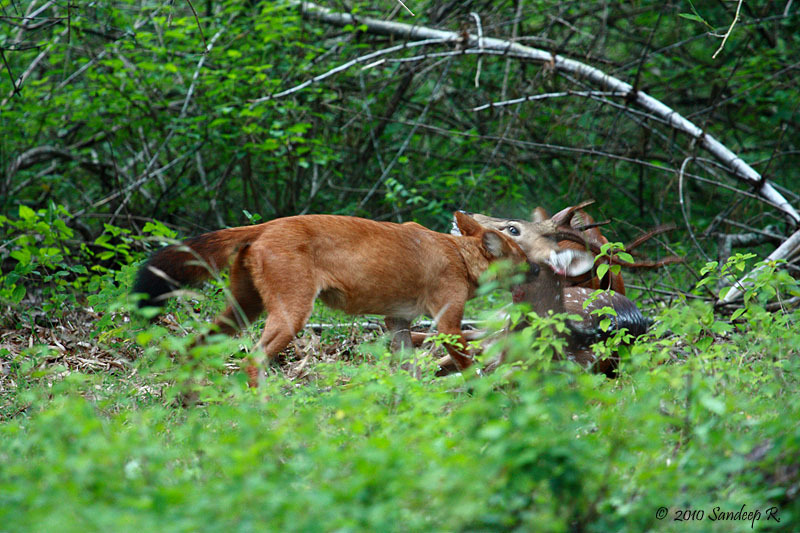 Soon, the deer was dead and another dog pulled the carcass inside the bushes. Little ahead on the road, the rest of the pack were waiting for the alpha dogs to arrive. Soon after the kill, the alpha female came to invite the rest of the pack for breakfast. She was so well greeted by her pups. They all strolled behind the bushes towards the deer carcass. We left them to have their breakfast in peace. I was not asking for anything more. But we still had two safaris. 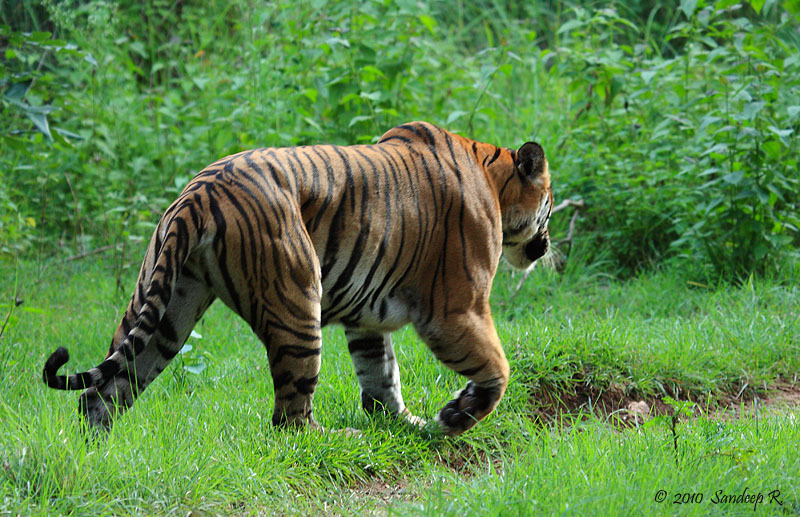 The best part of Bandipur is that you are not disappointed even if you don’t sight a tiger. 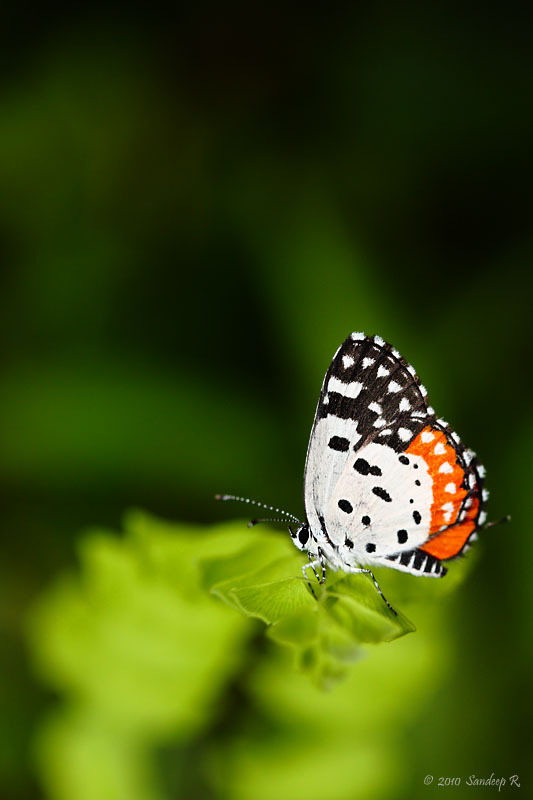 There are many other creatures that catch your eye, especially in monsoon. 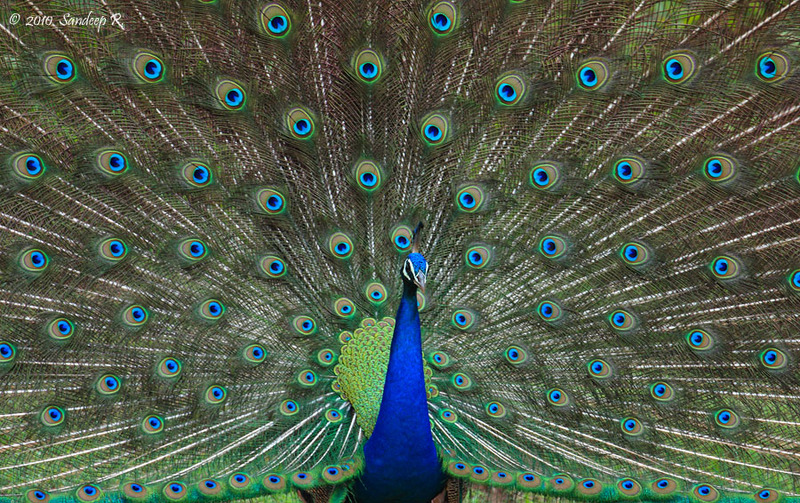 A Peacock was trying to impress a mate. The dance and the way he put up the show was a treat to watch. If he were a guy, women would throw themselves at him. 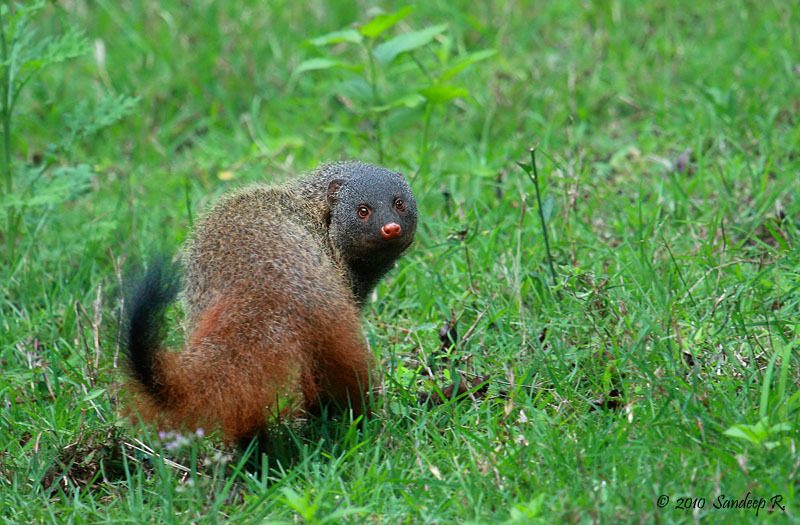 Stripe-necked mongooses are commonly found in Bandipur. Here’s one on his daily routine of finding beetles and other insects for a quick meal. 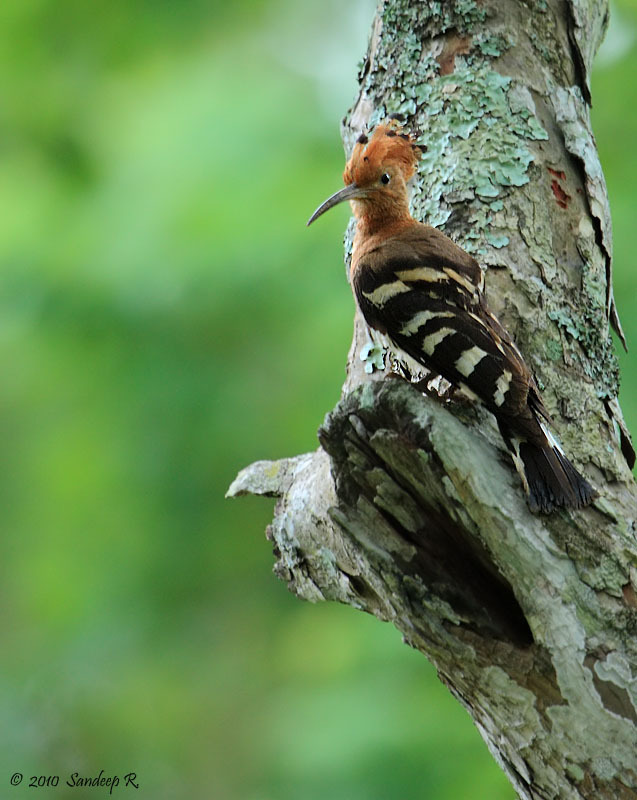 Bandipur has a variety of woodpeckers. 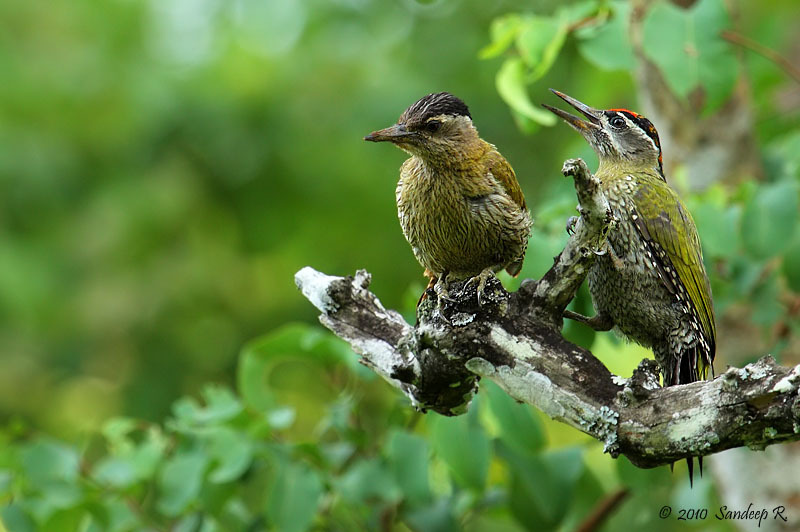 Before we sighted the tiger, we were enjoying the sight of a female streak-throated woodpecker, who was soon joined by her better half. Monsoon is the season of love in the wild. 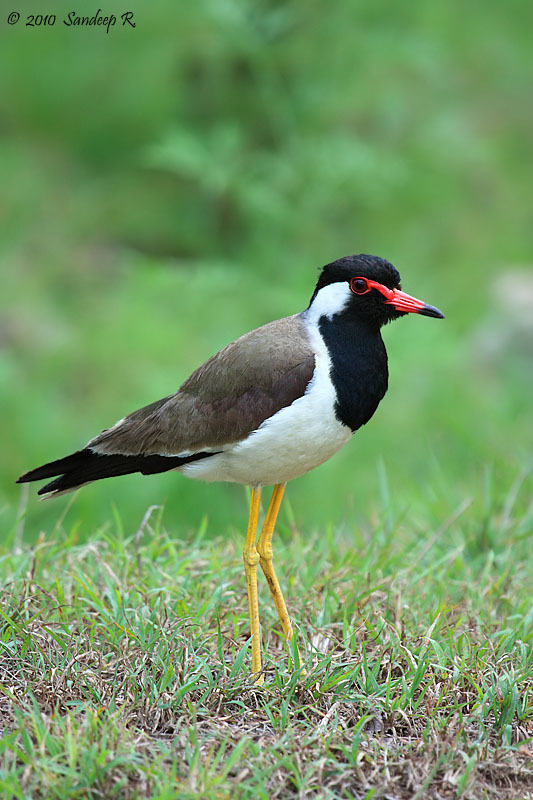 Red-wattled Lapwings are common around waterholes and open grass areas of Mulapura. This is only an indication of what one can find in Bandipur. Go, enjoy the rains! P.S. : This trip was from 6th June to 8th June 2010. I tried to restrict the number of images, but couldn’t resist posting these many.